Favorite Video Game : Anything. Transportation:Walking. Flying when wings are out. Family: All of her family members were killed by the demons at an attack and so far, the only surviver is Gabriele and her foster brother Inarius. However hard she tries, she can't seem to remember what Inarius looked like or even act like. It seems her memory of him was wiped out by someone. Race:Human before but an angel now. Weapons:A large, crystalized bow with intrigued carvings of both angels and demons on it with a set of ivory white arrows with swan feathers. Appearance: Average of height and petite in shape. Silver and honey gold mixed hair tied high behind her head in spiky arrays and two long thick locks of honeygold hair flow down on each front side of her head. Her eyes are of pale pastel like sky blue and her skin is so fair it gives her appearance a large contrast. She wears a top made out of velvet and gold thread sewn into delicate patterns. Three strings of crystals line themselves on her shoulders to form thin straps. Her dress is cream white, delicate and flowy. She wears a pair of sandals with long blue straps that ties itself up until her knee. When her wings are out, they are crimson red with streaks of white and large in size. Always wears a carefree and calm expression. Specialties:Fire attacks from far ranged, quick and agile movements. Weaknesses:Easily cheated because of her too trustfull personality. A few type of ice and water attacks. Fighting Style:Graceful, leet and light on her feet, when charging into battle she dances in such light and confusing movements that she confuses the enemy before giving them a quick kill. Usually she prefers to fire flaming arrows from a hidden area. Personality:Sweet, carefree and always smiling. She goes around trying to make friends with everyone she meets. Even a demon. Her motto is everyone gains a right to be happy. Seemingly air-headed, she is actually a cunning strategist and justified warrior of light. When made angry, her eyes flash a dangerous fire blue and her smile is just as dangerous. Very sensitive towards other peoples' feelings. Relationships:Younger sister of Inarius but doesn't really remember him although she determines to find him. Favorite Food:Anything sweet(chocolates, candies, lollipops) and apparently anything that looks, smells and tastes good. History:As the warm half plate sun setted into the ground and took its rays with it, it happened. The attack, legions and legions of demons poured out of the darkness, killing and devouring everything and anything living around them. Screams of terror and fear rang everywhere. Gabriele was huddled together with the rest of her family as they were being evacuated out and she beholded the sight of numourous humans being slaughtered and devoured alive by hundreds of bloodlusting demons. Running away, they were almost to the helicopter when demons suddenly soared the skies and surrounded them with greedy eyes. Everything happened so quickly then. Gabriele watched as she was being dragged away by a rescue soldier as her family was devoured alive and her brother fighting exaustingly for his life. Screaming and struggling against the man's tight grip, she called for Inarius to come as well. But nothing she said reached him as his mind was too preoccupied and she barely saw him dissapear into the dense trees of the forest with hundreds of demons behind him. Dragged by the soldier, they got into the helicopter and flew off. It was a tragic flight. The helicopter was attacked by airborne demons, and falling from the sky, it crashed into the ground. Hanging limply with multiple cuts, wounds and losing lots of blood, Gabriele stared at the sky with numbed eyes and waited to recieve the same fate as her family. However, instead of sharp daggerlike teeths sinking into her skin, she felt warmness overwelm her and someone layed her on the ground. She lost so much blood. 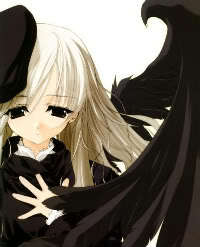 She saw a person with wings loom over her in a hazy shape before blacking out. After what seemed like a life time, she awoken and found herself alive and a surge of new strength pulsed through her veins. Standing up, she beholded the sight of utter destruction. Buildings were collapsed, burned or chipped off and blood was everywhere although the demons are gone. Looking down, she saw a large white feather on the ground. Walking hopelessly around, she entered a building made of bright lights and met winged men. Caught by the guards, she was brought forth to the leader of the angels. Proclaimed as an angel, she was released and lived as a citizen in the District of Shining Life. Discovering her new abilities and the truth to what is happening to the world, she trained herself hard everyday and applies to be a knight for the army of light. She hopes that one day, maybe she could find her brother again and regain her lost memories. Umm, read what she put in your weapon topic she said you can keep the bow since you started it already.